AVG Anti Virus is one of the most popular antivirus program which commonly used by people to secure their computers. AVG Anti-Virus Free Edition Products have become the choice of people as the Free Anti Virus Program with a great performance. Actually to remove AVG you can use the usual way with default program from windows, you can use feature Add/Remove Programs (for Windows XP) or using feature Programs and Features (for Windows 7 and Vista) through Control Panel. Click on the Start Button, select Control Panel. Open Add/Remove Programs (for Windows XP users) or Open Programs and Features (for Windows 7 and Vista users). Find AVG in the Programs list and highlight it. 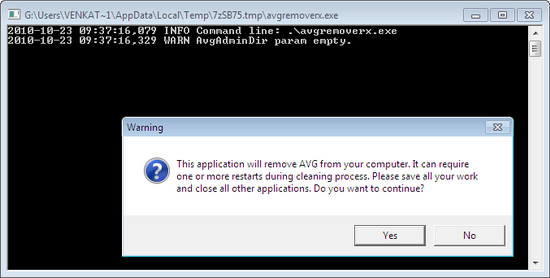 Click on Remove or right-click and select Uninstall and follow the wizard to uninstall AVG. So now for you who want to uninstall AVG, you have two options, using the default feature from windows or using AVG Remover (AVG Removal Tool). To make sure AVG is completely removed from your computer, use AVG Remover (AVG Removal Tool), because the tool is an official application from AVG to remove AVG products completely.